"The existence of a Chief Rabbinate in a Jewish state is a sanctification of G-d's name," says the head of Merkaz Harav to A7. 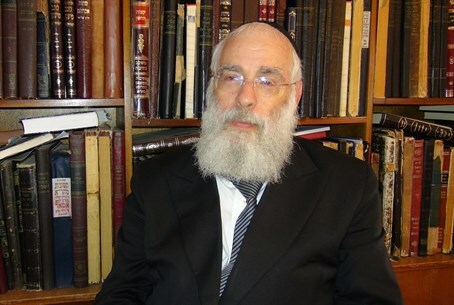 In an exclusive interview with Arutz Sheva, Rabbi Yaakov Shapira, head of the religious Zionist flagship Merkaz Harav Yeshiva in Jerusalem, member of the Rabbinic Council of the Chief Rabbinate and a candidate for the position of Ashkenazic Chief Rabbi of Israel, talks about the arduous campaign journey, about Bayit Yehudi's support for Rabbi David Stav and details his vision for the Chief Rabbinate. At the beginning of the interview, Rabbi Shapira asked to share a story that he finds especially meaningful during this period, one about a Gerer hassid who came to the Alter Rebbe with a commercial need that he wished the holy sage to pray for on his behalf. The Rebbe replied that what is really needed now is the Holy Temple and it is only through really feeling this need in our hearts that we can understand what else we lack. "That is what you and I should be talking about during this period of the Three Weeks," Rabbi Shapira said, "but we all in this together, we all are aware that the campaign for the Chief Rabbinate is taking place and that the image of that position has been somewhat degraded; public relations and other means that were not acceptable before have been put into play, as if the rabbinate is a commercial product, some kind of brand name. This has been going on for over a year and without going into further details, there is no question that it has hurt the Chief Rabbinate's image. That is one of the reasons that made me decide, after consulting with Torah greats, to contend for the image of the Chief Rabbinate. Q. When the elections were planned, did you expect such struggles to be part of the campaign? Rav Shapira: There has always been a contest. But the means expended on it have never been of such magnitude, and many of those who are involved in the process now realize that this should not have happened and that it was a serious mistake to allow it to happen. Q. The Jewish Home Party held a vote with a secret ballot and decided that Rabbi David Stav will be its candidate for the position of Ashkenazic Chief Rabbi. Do you think there should be another religious Zionist candidate? Rabbi Shapira: It is always better to have just one candidate from a religious sector, but woe to the rabbinate that comes from a specific political party. That goes against my principles, it is the antithesis of the position's mission. Whoever becomes the Chief Rabbi must be above politics, because if the Chief Rabbi is seen as the representative of one political party, I do not believe that he will be able to achieve a wide enough consensus to function. Q. You were against the Plan to Reform the Chief Rabbinate. Don't you think we need to change things so that more of the non-observant will feel connected to the rabbinate? Rav Shapira: Change is always needed, but the word "reforma" in Hebrew is associated with total change, leaving nothing the same. One does not have to uproot everything. The Chief Rabbinate is not just a bureau for religious services, not just a service provider, it has inherent spiritual character. Rabbi Tzvi Yehuda Kook zts"l (head of Merkaz Harav Yeshiva, son of Rabbi Avraham Hacohen Kook, Israel's first Chief Rabbi) asserted that the very existence of a Chief Rabbinate in the renewed Jewish State sanctifies the name of God. He who believes in the intrinsic spiritual value of this position knows that he must effect changes, but does not want to uproot the original basis of the institution from its source, rather build on the good. Q. It is known that you have wide support from the hareidi and secular sectors as well as the religious Zionists. Rav Shapira: "Let other voices praise you, not your own". (Proverbs, 27, ed.) I do not want to talk about myself, I don't believe I am the most worthy person there is and would be happy if those greater than I would contend for the position, but that is not the reality. One of the lessons I learned from the terrible terror attack on the yeshiva five and a half years ago is that one must not try to run away from difficulties. So if one has the ability to do things that can be of benefit – do them. I have the necessary experience as well, as I was privileged to be at the side of the late Rabbi Mordecai Eliyahu and my late father Rabbi Avraham Shapira during the 10 years, years full of accomplishment, that they were the two Chief Rabbis. I was there 24 hours a day, every day, and now if I am given the opportunity to lead the Rabbinate towards reaching its potential in its varied spheres of responsibility, I will thank Hashem for the chance to do my best. Q. Can you give us an idea of what kind of Chief Rabbinate you would like to see? Rav Shapira: One hope is that I would like to see the rabbinate function as our mentor Rabbi Avraham Kook saw it, to work on the connection between Torah study, Torah knowledge and a Rabbinate that reaches out and goes out to the people in the field. Not everything that is written in the media describes the reality here. The public is thirsty for the words of rabbinic leaders, wants to know more about its Judaic heritage and desires to live a life that is whole, a life of clear values, ethics and morals.